Substance, Vainqueur, Surgeon, Regis and Sleeparchive all on one record - it could only ever have been brought together by Berlin's Hardwax crew. Rumous of this twelve have been floating around more or less since the Scion Versions imprint picked up the ashes of Chain Reaction and formed itself as a home for Berlin's next wave bass-heavy, dub-infused techno and launched itself quietly into the world late last year with a pair of absolutely filthy, intense technoid variations. 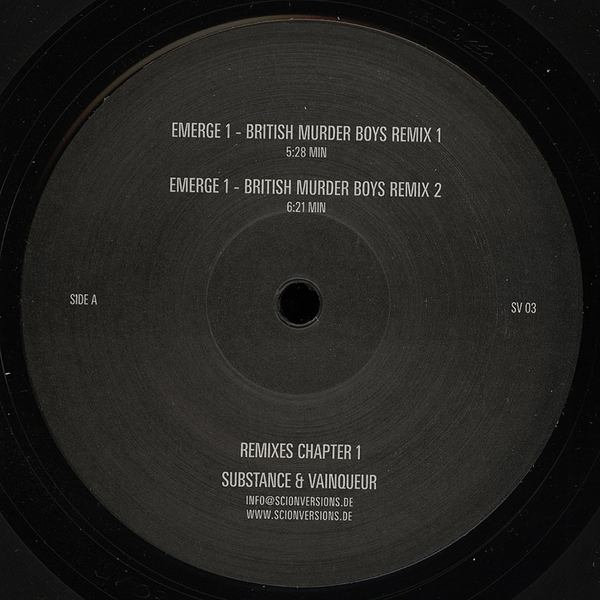 This third twelve is kicked off by two British Murder Boys remixes, Surgeon and Regis pummeling the original into submission with a typically fierce, robust, uncompromisingly structured 4/4 decimation that's just as tight and menacing as you'd expect. But it's the second BMB re-working that punches all the right keys for us - not quite as abrasive as the first, or as intense, but the metalic clank is back in full effect and there's a percussive swing to proceedings that adds a dark swagger you just won't find anywhere else. And we mean Anywhere. Sleeparchive dominates the whole of the flipside with his immaculately realised Chain-Reaction transmission, a fairly stripped 4/4 grind elevated into the relms of Berlins most deep and spacious heritage courtesy of a ghostly dub stab that's almost too sublime for words. It's minimal, sure, but all the bass-weight and classic Berlin styling are far removed from the icy tundra's of Finland's Sahko imprint, a place where Sleeparchive conducts most of his business. Mighty stuff, and another twelve from Berlin that you'll all be searching for high and low once it's gone - no sleeping y'hear?! KILLER!! !